There are new great opportunities be given to our Filipino Citizens in the near short period of days. 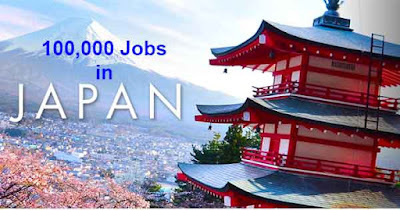 As reported in 24 Oras, GMA News Reporter JP Soriano reported last Friday, there are over 100,000 jobs will be open soon in Japan for Filipino and other foreign workers. One of the good news disclosed by the Philippine Overseas Employment Administration (POEA) and the Department of Labor and Employment, Filipino workers may be given the priority to be hired once Japan will start their hiring. ‘’ Japan’s Ministry of Health and Labor would soon open their market for Filipino skilled and semi-skilled workers under the Technical Intern Training Program’’ Bernard Olalia, POEA officer-in-charge reported. At present, officials from both countries are drafting the Memorandum of Understanding (MOU) for the program, he added. "Kapag ito napirmahan na, ‘yung MOU, magdeploy tayo ng mga professional semi-skilled workers under this new framework. Under this new track magde-deploy tayo for private institutions,’’ Ollalia said. As to the report, our Filipino workers who are in South Korea right now facing the crisis because of tensions involving North Korea will also be given the chance and be benefited from the possible job openings. DOLE, OWWA, and POEA are working together to prepare for any eventual repatriation for our OFWs which will include reintegration program, ‘’ said Labor Sec. Silvestre Bello III in the report. The report also added that although there are no job orders, interested Filipino workers are encouraged to visit regularly the POEA websites for any updates. From a great source, in present, Japan is in need of skilled works who are often directly hired and while others are hired through recruitment agencies which are accredited under the POEA. Japan is also looking for household service workers ‘’ kasambahay’’, drivers, English teachers, and even entertainers. The country is giving a high salary compared to our country. They are also hiring drivers who are not even College graduate as long as they can speak English. Filipinos who are planning to work in Japan will also no longer experiencing the strict requirements and application process of the said country because they already issued multiple entry visas for Pinoy tourists.